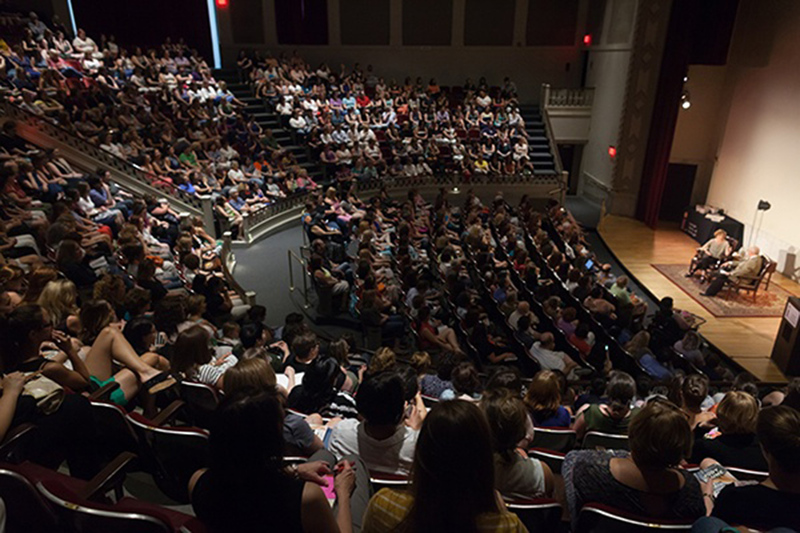 Pittsburgh Arts & Lectures has been bringing renowned writers of all stripes to the Carnegie Lecture Hall in Oakland for many years. You're Arts and Lectures package includes an overnight in a Mansions' Deluxe King room, two (or one) ticket to the Arts and Lectures presentation(s) of your choice, two (or one) voucher(s) for beer, wine or well cocktails in our cozy Oak Room, a signed copy of the author's book, and Uber transportation to and from the lecture hall. Package price is $279 per double occupancy, and $229 per single occupancy. Rates do not include tax. Note: Ticket portion of the package price is non-refundable in the case of cancellation. Tickets are subject to availability, and lectures frequently sell out. Joyce Carol Oates (Sept. 24): Pulitzer Prize finalist Joyce Carol Oates will be discussing her new fiction collection Beautiful Days. Luis Alberto Urrea (Oct. 8): Described as a "literary badass," Urrea's newest novel The House of Broken Angels visits the lives of a Mexican-American family as they await the death of their beloved patriarch. Katherine Boo (Oct. 27): Pulitzer Prize winner and winner of a MacArthur Foundation "Genius Grant," Katherine Boo's new book, Behind the Beautiful Forevers details life and death in an undercity of Mumbai. Masha Gessen (Nov. 5): Gessen is a New Yorker writer and recipient of the National Book Award. His latest work is The Future is History: How Totalitarianism Reclaimed Russia. Tayari Jones (Nov. 19): Jones' new novel An American Marriage is a tale of love and marriage, and was chosen for the Oprah Book Club in 2018. Dave Eggers and Moktar Alkhanshali (December 10): The renowned author of 10 books, Dave Eggers, in his latest offering, The Monk of Mokha, tells the tale of Alkhanshani. The young Yemeni American travels to his ancestral homeland to research the history of coffee and finds himself trapped in a war zone. Jill Lepore (January 14): In her new book, These Truths: The History of the United States, historian and author Jill Lepore offers a critical take on the founding of the nation. Ottessa Moshfegh (February18): National Endowment for the Arts fellow Moshfegh, in her latest novel, My Year of Rest and Relaxation, tells the darkly comic tale of a young woman seeking to hibernate for a year with the help of a psychiatrist. Valeria Luiselli (March 11): Born in Mexico City, Luisellie's fiction has been described "hallucinatory and innovate." Her new nonfiction work, Tell Me How it Ends: An Essay in Forty Questions features the voices of young undocumented immigrants facing the peril of deportation. Min Jin Lee (April 1): Lee's new book, Pachinko, was a finalist for the National Book Award. It tells the tale of multiple generations of Korean immigrants in Japan and their quest to thrive amidst many obstacles. For more information, visit the Pittsburgh Lectures website here.